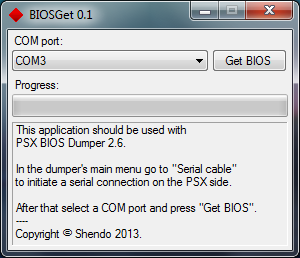 Recently I started programming for PSX once again so I decided to update my BIOS dumper. you don't have to use Memory Cards which makes the whole process a lot faster. Fixed error which displayed incorrect version and date on SCPH-1000 consoles. Added option to use serial cable. 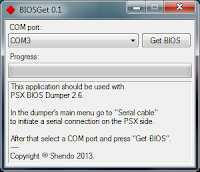 Updated BIOSmerge for Linux (x86 and x64). If you need a guide for using this software visit this thread. I have a problem with this software. I have tried with multiple consoles and PC's, even cables! When I press "Get bios" in BIOSGet, the TV screen flashes to "transferring data" then goes back to "waiting for PC" and an error message pops up on the PC saying it can't detect the console. I've tried my old Windows XP tower with a pure serial COM port, USB-serial adapters on my laptop, all with the same result. I have both a Net Yaroze cable and Sharklink cable- I bought the Sharklink one assuming my Net Yaroze cable was faulty, only to get the same result! What can I do about this? Hm... I developed the software with a custom made cable with only TX, RX and GND lines. even though I disabled that feature which should make it working for those cables. The cable that should work properly can be bought here: http://psx0.wordpress.com/2013/08/21/psx-serial-cable-now-on-sale/ (or you can cheaply build one on your own). Or if you are willing, you can to beta test my dumper so we can iron this thing out. Ah, that explains a bit. I tend to use real hardware where I can. I ended up sending the Net Yaroze cable to Shadow at PSX Dev as he wanted to use it for development, of course I did warn him it might be faulty. I do still have my Sharklink cable though. Yes, I'd be very happy to beta-test! I have a number of chipped machines and a debug console, and of course different PC's. I'd be very willing to test across a number of scenarios to figure this out. Hi. Sorry for taking so long to reply. I haven't got to this yet but I would like to. If I find time I'll contact you, if you are still up for it of course. Any chance you'd be willing to share the source code? 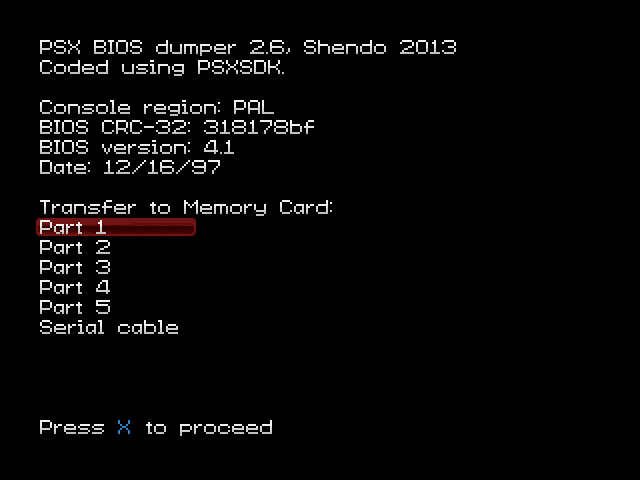 Or maybe add an option to dump PIO cartridge ROMs (ie. GameShark)? 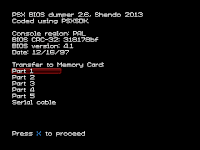 I want to dump/backup my GameShark Pro (ROM v3.1, which is not already dumped anywhere), but don't have access to a PC with either Parallel or Serial port (and can't spend on a used one just to do that). Forgot to specify: I do have a PS3 Memory Card adaptor and a Datel DataMax, so my idea would be to have the program dump the cartridge ROM to a memory card (by parts, as it does for the BIOS) and then use either the PS3MCA or the DataMax to transfer the parts to a computer and merge them there.